The longer and truly discovery of the beauty of the Bay, consisting of Cua Van village, Tien Ong Cave on Bai Tu Long Bay, pearl farm,etc. This is also one great opportunity to enjoy kayaking around Bat Cave; see picturesque areas like the the Tam Cung Cave and Poem Mountain. 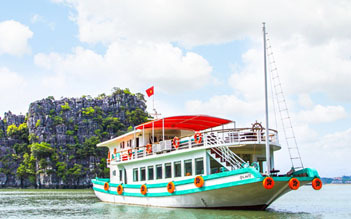 8:00: Optional Pick up at your hotel in Hanoi center, transfer to Halong Bay. 12:00: The boat sets sail to cruise into the Bay. 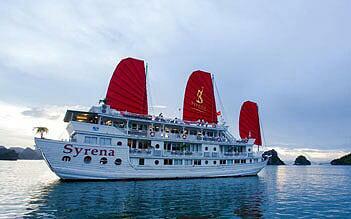 Find yourself getting acquainted with the facilities onboard. A delectable buffet lunch with a feast of choices is served in the restaurant. 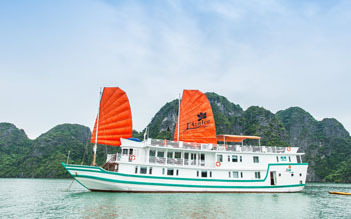 Savour your first hours in Halong Bay on the sun deck by simply let your eyes wander around the scenery. Back on board (around 8:45 o’clock) you may like to shower and freshen up. Now it is time to enjoy the last sailing time back to the harbor. A full breakfast is served in the dining room. Relax on the sun deck or dine in the restaurant while savoring the last cruise moments of this iconic site before arriving back on shore at around 11:00am. The crew will bid you farewell and you disembark with our tender boat to Tuan Chau Marina. 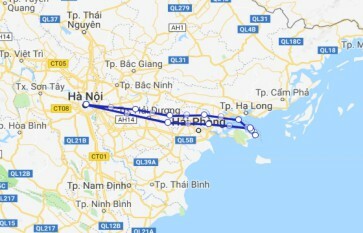 15:30: Arrive Hanoi, end of services. Peak season surcharge: + 60usd/pax on Christmas 24/12; New Year 31/12 and Lunar New Year’s Eve. Please pack your luggage and place it in the corridor before 9.00h on your last cruise day. Our crew will assist you with your luggage during disembarkation. Please settle your bill at the bar before 10.30am on that morning. This review is heavily influenced by the fact that we were lucky with the weather. We did the two night cruise and I'm pleased that we did. I think the one nighter would have been a bit rushed. We had the most basic room and it was a lot better than I had expected. Small, yes, but not impossible. The bathroom was perfectly adequate and everything worked. I hadn't appreciated how closely timetabled the whole event would be. It worked out for us, but mainly because we shunned the kayaking and stayed on deck, just sitting and lapping up the view and the sun. That window of relaxation in a stunning setting was magical and I think it's one of those things I will always remember. Yes, Halong Bay is busy. Yes, there are loads and loads of other boats. However, as a tourist, I feel that I;m part of the problem and can't really complain about it. The jasmine crew did seem to be better than most, however, at getting you away from the herd at times. Food was very good. There was a BBQ on deck on the first night. On the second night we were offered (as are all two nighters) a special menu. We declined and had the BBQ again - perfect shrimp, steak and pork and lots and lots of interesting salads. It's no wonder that we left heavier than we arrived! The view from the top of Titop Island on the final morning was great - worth the climb. So, for us, this was a really special couple of days and I recommend it. 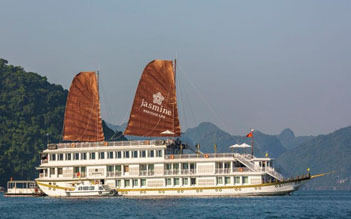 We loved every minute of our 2 Night Stay at Jasmine Cruise Ship! The Ship is so elegant and our bedroom was beautiful yet very practical! The meals were all so delicious yet so elegantly served! The Service was absolutely fantastic! Any and every wish was attended to right away! The Dining Room and the upper decks are so well designed so as to make everyone feel relaxed in a beautiful setting.. Every day we had really interesting day trips planned when ch we thoroughly enjoyed without being too exhausting or boring.. I’d Highly Recommend this beautiful trip to anyone planning to tour Halong Bay!